Open to sophomore and junior undergraduate women, minorities, and persons with disabilities, this new NSF-funded program is being offered to select students across 11 universities. During the year-and-a-half-long program, you’ll learn about the many academic and professional career possibilities in science & technology studies (STS) and science policy—the realm where science and society intersect—and get support to help you set and achieve your educational and career goals. STS and science policy careers and fields include, for example, science historian, environmental justice researcher, science policy analyst, research ethicist, economist, science museum curator, government program officer, philosopher, science diplomat, science communications, science law, among many others. The application period for the POSTS Scholars program is now closed. To apply, download and fill out an application. Because the paths to STS & science policy careers are sometimes ambiguous, you will be teamed up with a faculty mentor established in one of these fields to help you define and navigate your way forward. A faculty mentor will provide regular support and guidance throughout the program and potentially beyond. 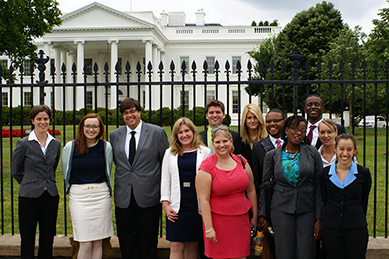 Participating students from the 11 universities will meet up twice in Washington, DC, for summer workshops and experience firsthand the complexity of the science policy and funding process and the key players in it. You’ll also have the opportunity to network with your peers who’re participating in the program across the country. 2015 Dates with either be June 7 - 13 or June 14 - 20. Throughout the program faculty mentors will assist you in choosing the best classes based on your particular STS or science policy interests and career aspirations. With the assistance of your mentor, you’ll also undertake a personalized research project. Participation in the program and mentorship are provided free of charge. Additionally, a stipend will be provided to cover travel, room, & board for the DC workshops.